A fun, family adventure that is buoyed by an extremely likable Jack Black performance. Black voices the hero of the story, Po, who has aspirations of being a kung fu master but he is grossly overweight and kinda, well, immature. When his village is under threat, the elders decide to follow the ancient ways and have their saviour chosen for them. Unfortunately, that saviour turns out be Po. As excited as he is to be training with the best, he continually works on their nerves and places everyone's future in doubt. 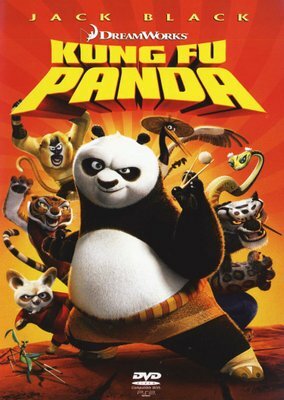 Unexpectedly chosen to fulfill an ancient prophecy, Po's dreams become reality when he studies Kung Fu alongside his idols, the legendary Furious Five -- Tigress, Crane, Mantis, Viper and Monkey -- under the leadership of Master Shifu. But before they know it, the vengeful snow leopard Tai Lung is headed their way, and it's up to Po to defend everyone from the oncoming threat. Can he turn his dreams of becoming a Kung Fu master into reality? Great kung-fu movie for kids and adults, beautifully and sensitively rendered. Even the presence of the dubious talents of Jack Black can't deny this movie its 5 stars. To sum up, it's an animated combo of "Crouching Tiger, Hidden Dragon" and good 'ol fashioned Bruce Lee kung-fu featuring a fat panda and a ninja team comprising a tiger, snake, cricket and baboon. Excellent fun!